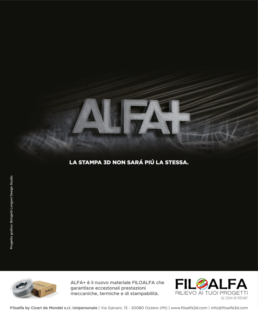 FILOALFA ALFAPLUS is the latest bio-based technical polymer in FILOALFA’s range of filaments and represents a step ahead in 3D printing. Its bio formulation respects the environment, have high mechanical characteristics and, after an easy treatment, excellent heat resistance characteristics. With the launch of the new bio-based filament, FILOALFA intends to renew its 3D filament offering, and asked our Studio to realize a series of promotional videos and pictures for the event.